Succeed in Cambridge English. Starters. 8 Complete Practice Tests. Cambridge University Press - 2018. 8 complete Practice Tests for young learners who are preparing for the revised Cambridge English: Starters exam (from 2018). 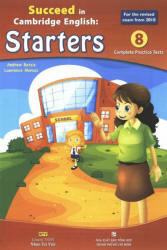 The tests consist of full-colour attractive illustrations and fun activities that are appealing to young learners. 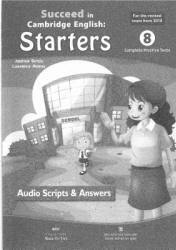 The accompanied Audio Scripts & Answers booklet includes information about the marking scheme, the answers to all the exercises, the Starters vocabulary list, examples of the type of interaction expected in the Speaking section and the Audio Scripts. The CD includes the audio files for the Listening section for all 8 tests, as well as the complimentary interactive edition of two tests (cross-platform compatible). Succeed in Cambridge English. Starters. 8 Complete Practice Tests. Audio CD (2018). For revised exam from 2018. Candidates should bring a pen or pencil for the Reading and Writing section, and should have coloured pens or pencils for the Listening section. The question papers contain spaces for writing all the answers. The test format includes multiple-choice questions and short answers. Candidates will need coloured pencils to respond to one task. Each of the four parts begins with an example. As in the Listening, this section's focus is on the present and relevant contexts for language. Candidates will need a pen or pencil for this section. Each of the five parts begins with an example. In the Speaking test the candidate speaks to one examiner for about three to five minutes. The format of the speaking test is explained to the candidates before they enter the exam room in their native language, usually by a person they know, or by their teacher. This person takes the candidates into the exam room and introduces them to the examiner. The section is assessed based on a rating for vocabulary and grammar, pronunciation and interaction.